The Christian Scholars Conference Records are ready for researchers. An updated finding aid and digitized selections from the collection are now available on DigitalCommons@ACU. Christian Scholars Conference 1982 program, box 1, Christian Scholars Conference Records, 1981-2009. Center for Restoration Studies MS #4. Abilene Christian University Special Collections and Archives, Brown Library. Abilene Christian University, Abilene, TX. The Christian Scholars Conference was created in 1981 by Dr.
to stimulate networks of scholarly dialogue and collaboration. 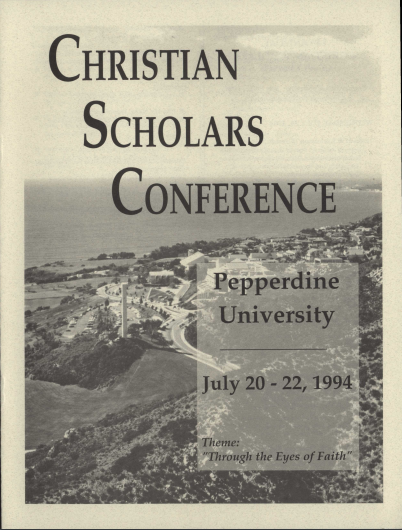 brochures, scholarly papers, and programs produced by the Christian Scholars Conference from 1981-2009. These records are housed in seven boxes. Holloway, Gary; Helsabeck, Dennis; and Foster, Doug, “Promoting Christian Unity – What Scholars Have Done Together” (2011). Lectureship and Summit Audio Collection. 147. Abilene Christian University and McCaleb, Gary, “On Campus Video, Featuring Thomas H. Olbricht” (1991). McCaleb & Company. 412.